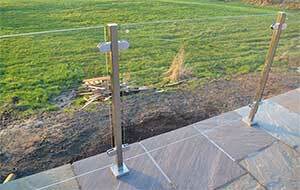 Stainless steel & glass balustrade - round posts and handrail. £280 per metre, including VAT and fittings. From 2 days to 2 weeks for build and delivery. 100mm high. Any length can be made to order – the maximum width for each pane of glass is 1500mm. 50mm diameter 316 ‘marine grade’ tubular stainless steel which is corrosion resistant, and will not oxidise like aluminium. 10mm toughened clear balustrade glass is supplied standard, or you can have a different look or privacy sections with white sand-blasted glass for an additional £25 per metre. Also available with an oak handrail – ask us for a price on this. Delivered to your door with all fittings, ready to install. Photos of ‘Franklyn’ glass balustrading at the Forest Park Lodges development. In one photo you can see Steve’s wife Julie.